Tourism has become increasingly ‘exotic’, a process made possible by low-cost charter tourism and cheaper air tickets. Faraway and evermore ‘exotic’ holidays are becoming widespread and within reach as destinations make their entry into the mass tourism market. Strolls through the bazaars of Istanbul and cruises on the Nile are packaged into the sea, sand and sun culture of traditional forms of organized mass tourism. At the same time new technologies weave the fabric of tourism and everyday life even closer, circulating images, information, and objects between them. Taking off from this observation, Tourism, Performance and the Everyday invites readers to follow the flow’s of tourist desires, objects, meanings, photographs, fears, dreams and memories weaving together the spaces of and between Western Europe, Turkey and Egypt. 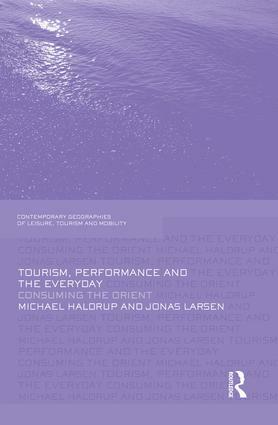 Tourism, Performance and the Everyday carefully analyzes the cultural and social impacts of mass-tourist experiences of ‘exotic’ places on the wider aspects of everyday life. It treats mass-tourism as a cultural phenomenon that feeds into the practices and networks of peoples’ everyday lives rather than as an isolated, trivial or ‘exotic’ event. It traces how these impacts are mediated by various mobilities between home and away through innovate mobile and ethnographic research methods at tourist destinations and the home of tourists. The book contains analysis of diaries, photographs, blogs and photo web sharing sites, participant observation of performing tourists and ‘home ethnographies’ of the afterlife tourist photographs, souvenirs and memories. In doing this, the book traces out the multiple interconnections and mobilities between everyday spaces and leisure spaces as well as the multiple ways in which the Orient is consumed on holiday and at home. The book appeals to a wide audience among students, researchers and educators within the social and cultural sciences studying, researching and teaching theories and methods of tourism, Orientalism and cultural encounters as well as broader issues of leisure, consumption and everyday life.